I think that I have everything under control, but they aren't. One day Daisy is perfect baby anyone can dream of and the next day she is not. Yesterday she slept the whole morning after her bath and feeding so well that I had tons of time for breakfast, tea, surfing internet and work. Hoping that today it will be the same, I gathered my work assignments and tea but Daisy woke up and wailing to come to my arms. So , there goes my tea. Therefore, while setting a routine is crucial, always hoping that things will be as planned is wrong. Parents must keep an extra hour before taking any journey. Reach early for any appointment. Finish essentials like shower, breakfast, etc. before the baby gets cranky. 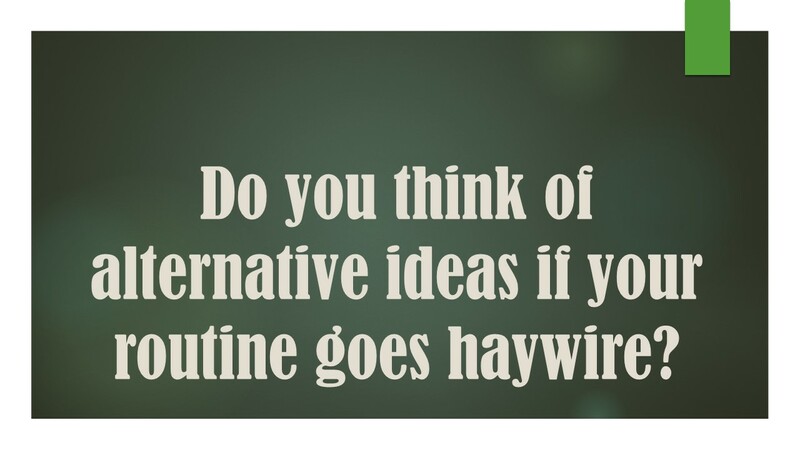 And, think of alternative ideas if the routine goes haywire. Do not get too fixated at routines and be okay with changes. Its foolishness on the part of adults to think that the baby will understand your work pressure or that mum can be hungry too, she hasn't eaten anything since morning. I have experienced that there is no point swinging Daisy and put her to sleep because when she is actually sleepy, she needs no swinging, can doze off when t.v. or radio is on, lights are on and people are chatting nearby. To summarize, your baby is the boss of your house. Let them be. There is literally no other option!